Ok - I know you've all been waiting to see what has happened this week. Willie was unhappy with the way the first plumber had capped the waste pipe into the stack, and had joined the original water hot and cold into the raised intakes. They jutted out beyond the wall behind the refrig, and Willie believed they could have been plumbed to be contained within the wall. So enter plumber #2. We were thrilled Monday night to see no plumbing encroaching on the room space. 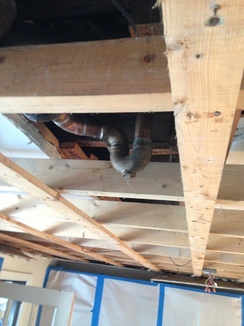 A second layer of strapping had to be added to the ceiling to accommodate the trap for the upstairs tub, which still caused the waste pipe to descend a wee bit below the original ceiling. Additional adjustments had to be made to the electrical fixtures, to lower them another 3/8" for the new layer of strapping. This was all in preparation for the plasterer. The rest of the week involved having the plasterer spend a day making our ceiling beautiful. And completing the second phase of the floor removal. This took another 3 hours of the pneumatic hammer, and (Norm was so happy) the use of the walloping tong bought earlier on in this project. And another bagster pickup! What fun! Here are some pics of the new high ceiling. And we also have a subfloor! The rest of the old concrete floor is what went into the bagster! 6) We ordered the hinges, handles and cup pulls for the cabinets. 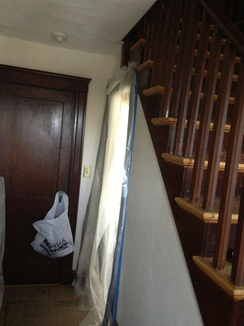 7) We removed the old wallpaper behind the refrigerator and on the lower half of the wall next to the basement stairs. I think that's it. I had a release week and weekend at work, and Norman scraped together some time to visit with visiting grandchildren from Connecticut. And Christina dropped in for the weekend, for a North U seminar at MIT, laser racing in Newport and a business meeting in Boston tomorrow. We have very full lives! Every time we went to Wolfers, I would gravitate to this outdoor light. It just looked so what? magical? right? I don't know. I had to have it. Now we do. I can't wait to see it installed. The Hubbardton Forge Erlenmeyer Wall Sconce. This is in bronze, but we ordered it in black to match our Don Quixote lamp over the garage. Here is a picture of the Quoizel Semi-flush mount in antique nickel, for over the kitchen table. These babies are now stored in our dining room, along with all the tile and flooring and other stock that needs to be installed. 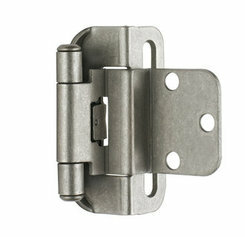 The hinges are Amerock, from PullsDirect.com, which had them in Weathered Nickel. The polished or brushed nickel hardware just seemed way too precious, and I think maybe would look to new and pristine. So I searched for weathered nickel, which is somewhat distressed looking. These are 3/8" Inset, self closing, partial wrap hinges. Because we have doors that are inset, and I'd like not to have to use metal tabs and magnets to keep the doors closed. and here are the cup pulls. Christina liked the bigger depth cup pulls that I found at Lowe's from Martha Stewart Collection, but I couldn't find any handles to match that I liked. If I buy them both from the same manufacturer, I'm hoping that the notion of "Weathered Nickel" will translate from from pull to the other, so we don't have conflicting shine and reflectivity. Although, Norman is entranced by the novelty pulls we have found, spurred on by our friend Suzanne, who suggested thinking outside the box. There are a couple of the pulls we are considering. Not for everywhere. Probably one or two, here and there, to intrigue the grandkids. I'll share those with you next time. We are going to settle down and watch the Pickwick Papers and have a picnic out of our pantry in the sunporch. So a whole week has gone by since I've been able to put up a blog post. I went back to work on Monday, which was the day the ceiling demo was to take place. The ceiling, if you recall, was a good 6-8 inches lower than any other ceiling in the house. I felt it made the kitchen feel more closed and claustrophobic than it had any right to be. All the plaster walls and ceilings in the rest of the house were in good condition, so I really didn't believe that it was covering up something awful. Willie was willing to pull it down and see. This is the trap for the tub upstairs. This is the old iron waste pipe running from the tub to the waste stack between the kitchen and first floor bath. 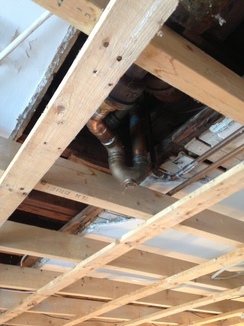 From this perspective you can see how the bath tub trap hangs down a good 6 inches from the former original ceiling. So, now what? Well I guess there may have been some technological advances in plumbing since the 1970s. PVC for example. And interesting trap configurations. 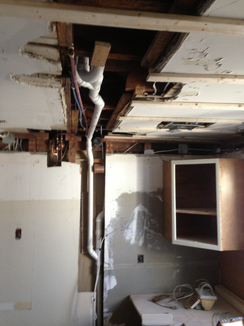 To jump ahead and not keep you in suspense, here is today's picture of the same tub to waste stack plumbing. 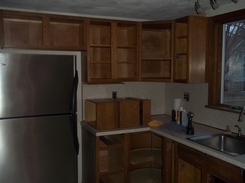 You might notice that all the upper cabinets, except this one corner cabinet, have been removed. They're all out in the garage, chumming it up with the doors. 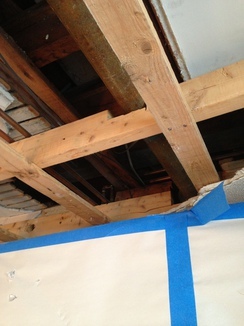 The framing and strapping for the lower ceiling has also been removed. Optimistic strapping has been hung just below the original plaster ceiling. Next step after removing the lowered ceiling and agonizing for days over what to do, was to remove the floor. This took a pneumatic impact hammer. I didn't actually see it in action. Maybe I am better off. Here is the kitchen floor before being pummeled to death. All that tile (you can't see how really ugly it is) was on top of about 1 1/4" of concrete. There are the rafters in the basement ceiling, on top of the joists. Then some boards (not a true subfloor). Then felt was laid. Then a soft steel mesh. The a whole pile of concrete was poured on top of that. Really. And we're not sure how they laid the tile then; maybe after the concrete subfloor cured, another layer of mud was poured and the tile was set. This was not a demolition for the faint of heart. It resembles a moonscape. 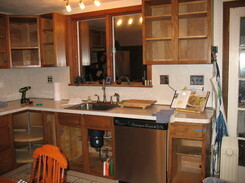 So all the upper cabinets are gone.The formica on the countertops and backsplash are gone. The lowered ceiling is gone. The stove is gone. The sink is gone. The tile is gone. And there is dust everywhere. Upstairs in all the rooms. Downstairs in all the rooms. Filtering through the felt like snow in the basement. We did not prepare the house well enough for this onslaught of dust. Friday was our anniversary, and after working late, Norm met me in town with the truck, and we went to Ristorante Olivio, in Arlington. I was so happy. I just wanted gnocchi. And he wanted soup. And we got just what we wanted. And it was yumm.... We had the nicest waiter, and he sympathized with our kitchen plight, and we encouraged him about his kids, and life was good. We went home and collapsed. Yesterday dawned bright and hopeful. Norm popped off to officiate at one of our CYC education seminars (boat electrical systems - you can love 12 volt systems). He bought everyone coffee and chatted with folks. Meanwhile I disinterred our aged Hoover, and set about cleaning. I started on the second floor, while Matt the plumber and Tom the electrician got to know each other while sharing the same workspace. Yes, this was Saturday. We are very grateful for folks who will show up and help us. It took most of the day to purge the upstairs of dust. Heating system was turned off. Doors were closed tightly. Bedding was changed. Bathroom was scrubbed. 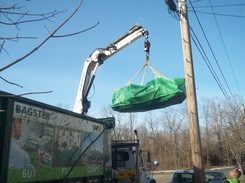 Everything that could be washed or shaken was removed. This approach created a lot of laundry. Which we couldn't do at home anymore because the water was turned off. And it was snowing concrete in the basement. 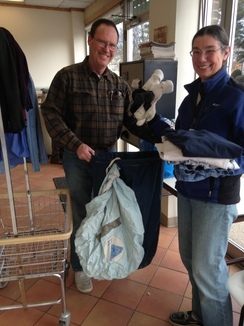 Who else but a sailor would use a spinnaker bag to carry laundry to the laundromat? I hadn't been to a laundromat since probably the late 80s, when vacationing on Cape Cod and sharing a house that didn't have washer/dryer. We found this one when we popped out on Saturday for lunch, in Arlington, on Mass Ave. I can't find it's name. We figured it took about $20 to do all the sheets, bath towels and mats, and a week's worth of laundry. We got to read our kindles, and then Gladie stopped by for a visit. She had attended the electrical seminar and wanted to check in, so she drove to Arlington and helped us fold unmentionables. We all went back to the house afterwards, and showed Gladie the devastation. Tom and Matt were still plugging away, so we gave her a tour of the painted doors, which in the daylight revealed that they need (NO!!) another coat of paint. Sigh. Sunday we spent all day cleaning the first floor, de-dusting all the upholstered furniture and putting up more effective dust screens between rooms. Because, there is still more floor to remove before a subfloor can be put down. Dust doors to Living Room. 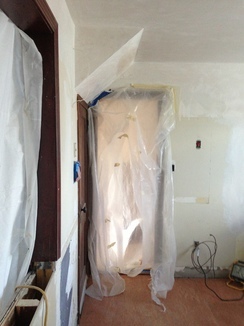 Dust door to kitchen from hallway, and rosin paper along entire hallway. Still deliberating about taping rosin paper to the stairs. 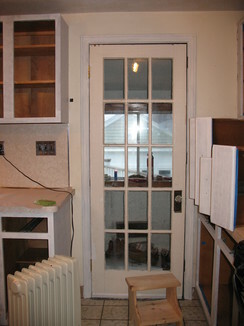 Dust door between kitchen and dining room. 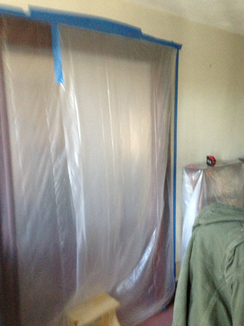 There is also another dust barrier between the dining room and the hallway. This picture gives you a pretty good idea of how much height we have gotten back by removing the lowered ceiling. The dark area above the sheetrock is new height. This gave us more room to pick interesting lighting for over the sink and over the kitchen table. We set out for Wolfers Lighting this afternoon, to re-evaluate our former choices. After chatting with our lighting advisor, we did change both lights. For over the sink, we went retro and picked a light that looks just like this. Price is right at $19.95. The choice for over the kitchen table is a bit more pricey. 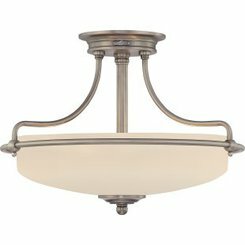 A Quoizel 17-in Antique Nickel 3-100W semi-flush mount. Last but not least we broke down and bought an exterior light that has just captured my fancy every time we visit Wolfers. This is for outside the back door, where we currently have no light. 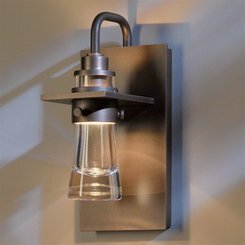 It's a Hubbardton Erlenmayer Exterior Wall Sconce, in black, to match our garage Don Quixote light fixture. It is going to look just right. So, after a dinner from Whole Foods prepared food section, we are exhausted and ready for bed, and a new work week. Thanks Whole Foods for feeding us. I had to laugh out loud when I saw this in Google search. The address for the Joe's that we usually frequent is in "Meford". Without the d, as in MeDford. Everyone here pronounces the city name without the D, so I had to chuckle. Actually they pronounce it Meffah, without any Ds and no R. That is the Massachusetts way. We are very frugal and save all our consonants. Who knows when we might need them? Ok back to dinner. We got to the NYAJ's in Arlington, and the place was packed. Why? Wassup? We want to eat, and we don't want to wait.The wait was estimated at 35 minutes. Our Plan B (as sailors we always have a Plan B... and C and D). Our plan B was to walk down the block to the Indian Breakup restaurant. We used to love to go there, great Samosas and Pakoras, and I like the Sag Paneer, and Norm goes for one of the hotter curries, and we were always very happy. And then a friend of mine in orchestra told me that this is the restaurant she always chooses when she wants to break up with a boyfriend. The restaurant is perfect for break-ups. Hmm.... We started thinking about the folks we see there, and they all were probably breaking up. Really? Now it seemed really likely. Anyway, we started to head down the block toward the Indian restaurant, but I had my heart set on the great bread with oil and parmesan cheese that the give you at NYAJ's to stave off hunger pangs and prevent riots and mayhem. So we turned back and put our name on the list and waited at the bar. Once seated, Norm realized that our 2 door down neighbors were seated at the table catercorner to us. So we told them about our kitchen renovation project, and they acknowledged that they too had painted their cabinets and updated their kitchen and got another 15 years out of it. 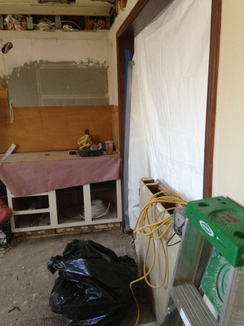 And then 3 years ago they actually renovated their kitchen, and would we like to come by in the morning an see it? Well, yes, we would! Wow! So that's how we started out our Day 9, by driving (yes the house is only 2 doors down) to our neighbors to rouse them during their first cup of coffee, to get a tour of their kitchen. Which I have to admit was pretty awesome. They had incorporated 3 rooms, into one big kitchen with a bath. It was hard to imagine how it might have looked before, but I think 3 season porches and probably some magic was involved. We are never going to have a kitchen as nice as theirs. Expectation reset. Next up was Lowe's which happily opens at 8am. We were still struggling with daylight savings time, and trying to figure out if we should be hungry or not, but off we went in our little truck to Lowe's to check out their cork floors and see if we could touch and feel one of their exhaust vents for over the stove. I guess we're getting pretty good at the pre-shopping online stuff, because in less than an hour we had dropped another house unit ($) which got us the cork flooring on order, a new exhaust fan that we couldn't touch and feel but looked just as nice on Nino's monitor as it did on mine, and two lally columns with pads on both ends that will make a perfect dust door in the dining room. In addition to this big dust door, we will also have 2 smaller ones. One in the hallway outside the kitchen blocking off the front door, and the other in the dining room, blocking off the entry to the hall. 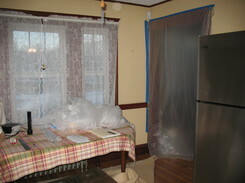 That is our dining room, now with refrigerator in it. Boy was that fun this morning. We have no idea how they got the refrigerator into the kitchen. There is no entry into the kitchen that accommodated the width of the refrigerator. We were imagining very strong people lifting it over the "island" counter that we have hated since we moved in. Or bringing it through the window, after removing the window. There are no other entries into the room that would allow the refrigerator to pass. We took off the refrigerator doors, and the extra screws at the base. Then we unscrewed about a thousand screws that held down the "island" countertop. 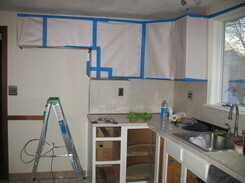 Then we used the crowbar to pry off the moldings under the "island" countertop. At this point if we all held our breath, the refrigerator might make it through. Phew! You can see it above in the dining room. So it worked. So I spent a happy afternoon moving the cabinet doors to the garage. Better than working out at a gym. And cheaper too. And I was able to sand, degloss, and put another coat of paint on. I am hoping that tomorrow "I am going to love it!" because I am going back to work tomorrow, so seriously this coat (the fourth) will have to be last one. And I will love it. 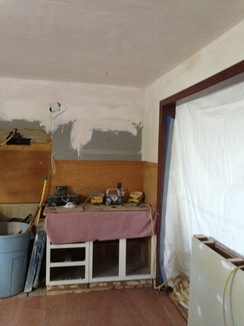 This is what our kitchen looks like now, ready for Willie to demo the floor tomorrow. Dinner tonight is Shrimp Mushroom Risotto with peas. Norm is right now adding a little teriyaki on his. So I have to go. I drove back today from Cape Cod, taking the northern route, 6A, to see what I could see. Mostly I noticed that marshes that used to be mostly reeds and grasses, were now filled with water. It was apparent in some spots, that water had overwashed the road, either Friday, or Saturday, during high tides. 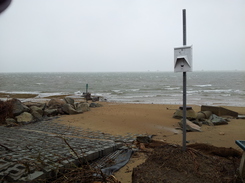 The north-east winds and high tides created a great press of water down from Cape Cod Bay, into the back sides of the barrier beaches and sand spits, which are usually pretty well protected from these winter storms. In Brewster at the Museum of Natural History, the boardwalk nature trail on the south side of 6A was under water. The marsh behind the Marshside Restaurant was open water, instead of a meandering series of waterways. The marsh behind Mr. Whitfield's house was full of water almost up to the barns. Scorton Creek looked like it had also washed over the road, and even though there are buoys to mark the creek, there was no way to discern where the creek ended and the marsh began. Back to the kitchen. 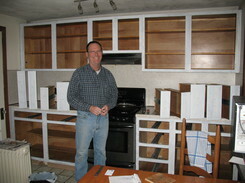 Norm taped up the upper cabinets with paper today, in preparation for the demo of the tile floor on Monday. The drawers are now in the basement staged for their extra coats of paint. Friday morning broke with many inches of snow on the ground in Medford. Not the 1-2" forecast for the Boston area. The snow continued to fall during the morning hours, and into the afternoon. Norm went to check on Averisera, because she has been sadly neglected while we shower love and attention on the kitchen. Poor baby. 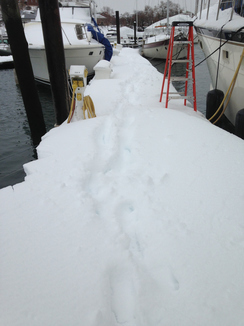 Deep and drifting snow covered the floating docks. 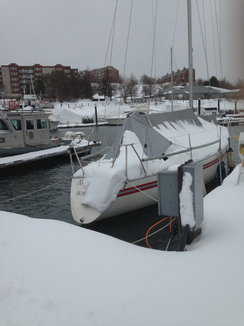 Averisera looked like she had weathered the wind and storm surges, in the protected marina at Admiral's Hill. Norm told me that everthing inside had sought its lowest energy level. Averisera strained at her lines through waves and wind, and everything that had been on a shelf or berth, was now on the floor. Not unexpected. I'm just glad that we were not on board! 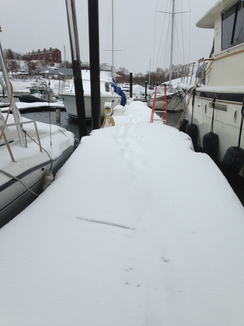 I feel for our boating friends who live aboard at various spots in Boston Harbor. While I was down on Cape Cod, doing daughterly things with my Mom, Norm was bacheloring it back in Medford. He had been invited to Kittery Point Yacht Club, to give a talk on Small Area Weather Forecasting, a topic of interest to cruising and racing sailors. This event was scheduled for Thursday night, in Portsmouth, NH, the very night that Winter Storm Saturn was delivering it's one-two punch to New England. 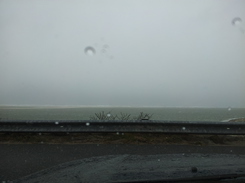 I headed down to the Cape in heavy wind and snow changing to rain. He headed north in heavy wind and increasingly heavy snow. 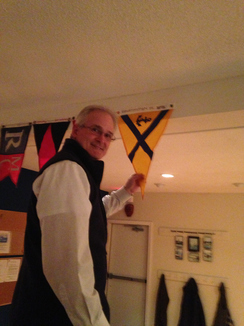 The talk was well attended at KPYC, and as Commodore of Constitution Yacht Club, Norm presented a CYC burgee to KPYC Commodore Tom Dolan. 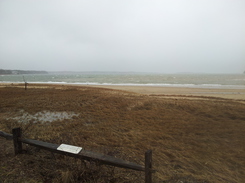 The winter storm on the Cape brought big winds and driving rain. Not much in the way of snow, although periodically one of the squalls will deliver fat wet flakes. The big story down here is the coastal flooding. 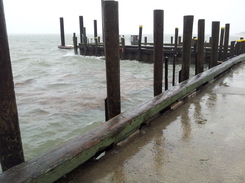 A big storm surge, combined with extra-high tides, has caused local damage in various towns. 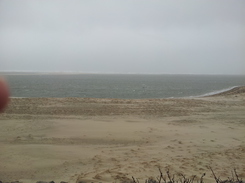 We heard that a breach in the dunes in Truro allowed ocean water to surge into the Pamet Valley, filling a fresh water pond with salt-water. In Sandwich, the entire boardwalk at the Mill Creek, is under water, and the bridge is damaged. After a morning of setting up the medial alert system from Assistive Technologies, we had a quick lunch, and set out to do some errands. The wind was blowing hard, but visibility was good and there was no slush or frozen rain on the roads. Bank first, CVS next to get haircutting scissors, and then to Mid-Cape Lumber to see if they had any stove exhaust hoods on display. We were disappointed in the selection there, but did get to look at cork floors again, in a much bigger variety of colors than were in Home Depot or Lumber Liquidators back home. Even seeing a bigger variety of color, I still am leaning toward the natural cork color. So that was nice to confirm. After our errands, we tootled along Route 28 toward Chatham. This was now around 1:30pm so I guess about 3 hrs after high tide. Pleasant Bay had whitecaps, and rolling waves onto the beach. The parking lot on the Chatham side was under water, and Muddy River was a huge basin, not a little creek. Here is a picture of the beach right next to Route 28. As we came down the road, there were cones and warnings of the road flooded out. Probably at high tide. But boy is the water close to the top of the beach, 3 hrs after high tide. We drove into Aunt Lydia's Cove, where the force of the wind made it hard to stand up. Whitecaps and waves. 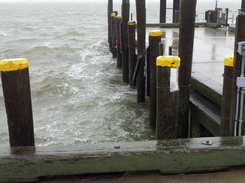 We drove down to the Fish Pier, where the water was pressing against the dock and the building. Chatham Light was a popular spot today. Many folks watching the waves in their cars. A few pics. Big rolling waves tumbling over the outer beach. 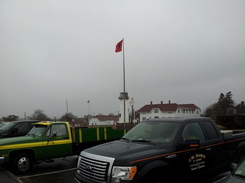 Gale Warnings up, Chatham Light. Rollers on the North Beach, Chatham. Thursday dawned pretty bleak. A big winter storm had arrived overnight, and we had about an inch of snow on the ground by 7am. I was planning to make a trip to visit Cape Cod Grandma, in order to do her taxes and set up a medical alert system that I had bought. Mostly to relieve our anxiety, me, my siblings and all our spouses. Mama is a willing participant and it seemed like the right time to put this technology into place. We had purchased a system from Advanced Technologies, a one time upfront cost, no monthly fees for a national call center service. You program your own call tree in, up to 4 numbers, and the fifth number dials your local 911. 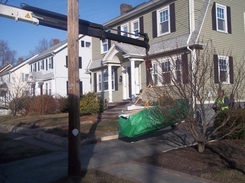 We watched the weather, both local in Boston and what was going on down on Cape Cod, and as the morning continued, and the temperature went up a few degrees, the snow began to melt on our streets. 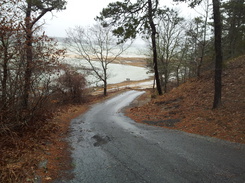 Down on the Cape, the precipitation was forecast to be mostly rain. So we put a third coat on the door fronts down in the basement, and I packed a light bag, and set out for the Cape. Norman had a talk to give at the Kittery Point Yacht Club that evening, so he needed to prepare for that, and the drive, and also start marking 50 student presentations to hand back next week when school began again. The drive down to the Cape was uneventful, and I hear that the Weather Seminar at KPYC was well-attended and well-received. Busy and long day, Thursday, in home improvement land at the Lamb-Martin kitchen. 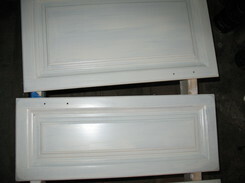 First up was to get the second coat of the Benjamin Moore Advance Paint, MilkyWay, on the backs of the doors. Before flipping the doors over, I lightly sanded the flat surfaces of the fronts, with 320 grit. We turned each one over, and deglossed the backs in one pass. Then came back to the start, with Norm rolling via the foam roller, and E getting the grooves, edges and tipping. Also removed missed drips from yesterday with a razor. This took us almost to lunch time. We had an early lunch, and then popped into town to get a book Norm had ordered at the Emerson Barnes and Noble. I dropped him off on Boylston Street and took a turn down Charles, Beacon, Dartmouth, Commonwealth, Arlington, and back to Boylston where he was waiting for me. He had misplaced his Peterson's Guide to Clouds and Weather, which is basically a Field Guide, like the ones I use for birdwatching, but this one is for identifying clouds and weather, as the title states. Norm is giving a presentation tonight at Kittery Point Yacht Club on Small Area Weather for Sailors, and he is bringing a number of resources for folks to look at, this being one of them. Our copy is probably on the boat, but you can always use another one for the car or house. 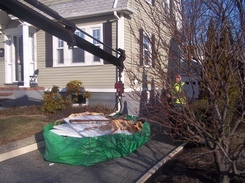 Then we were off to Tony's Imported Ceramic Tile in Stoneham. We were heading out in the car last weekend on one of our trips to Lamson and Davis, and our neighbor Laura came out so we chatted from the truck cab as we are wont to do here in Medford. "Oh you have to go to Tony's Tile" she said, when she heard we were going to re-do the kitchen. So off we went to Stoneham, to see what Tony could do for us. Richard met as at the door and we told hiim Laura sent us. Off we went around the showroom, while he asked us some questions, which really focused the choices. I had brought the paint chip, and the sample countertop material, so we propped them up on various backsplash displays to try to visualize the effect. We don't want too much texture, because none of the materials we are using are what you would consider "precious". Formica, painted cabinets, cork floors, all bespeak a practical, functional kitchen. Not a Tuscan grotto, or a modern sleek design. We bought a simple cream colored tile, 3x6 (subway tile like), Renaissance Navona, which will look nice in a running bond. The tile has some variation color-wise, but not much surface variation. So it will look smooth, although not shiny. By the end of our jaunt, we had the tile in the back of the truck and headed back home to meet up with Willie, who is going to provide some professional assistance in the carpentry area and floor demo. The tile floor was put down with a felt layer over the sub-floor, which is not a true subfloor as we think of it, but basically just wood stringers over the floor joists. They have maybe 1/2" space between them. The felt kept the mud from pouring through these spaces. Over the felt they laid a metal mesh, and then poured about an inch of concrete. So we have a very hard concrete floor, on which the tiles were then laid. Willie estimates 2 days with a pneumatic hammer to remove the floor. Then a new subfloor must be laid. On top of this we are planning to install Thermosoft Radiant Heat floor mats, to add heat to this currently unheated room. For this we will need an electrician, to install the mats and hook them up to a wall thermostat. The excitement just thinking about having heat in the kitchen is way up on the happy meter. 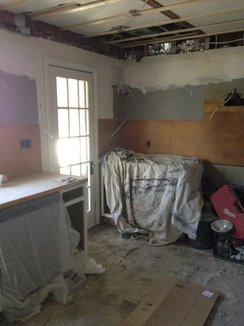 In addition to the floor demo, Willie is going to remove the current "island" or counter, that was installed between the kitchen and the dining room. 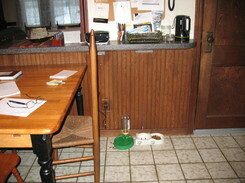 If you were to pull stools up to this counter, you would be facing away from the kitchen into the dining room. 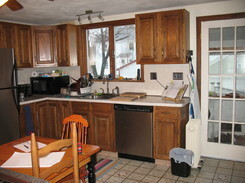 There is no leg-room on the dining room side of the counter, and there is no space in the dining room for stools. So Willie is going to fix this oddity by removing the current trim around the opening between the two rooms, and make it more like the trim in the rest of the house. He's also going to replace the current counter, with wood trim, and have it just pass-through size, so maybe 10 inches wide. 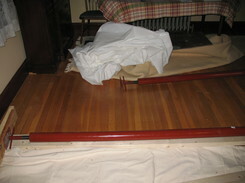 It will be the same cherry stain as the rest of the house and I think look much better, and be more functional. Here is the silly non-functional counter. Willie is also going to fix up the mud room, our current back door entry, so that it too is more functional. Remove the exterior house shingles, put in sheetrock, improve the lighting. After meeting with Willie, we got the paintbrushes out again, and put a second coat on the door fronts laid out in the basement, and another coat on the face frames of the upper cabinets. So two coats there now. We did not do another coat on the base cabinet face frames, since we'll be pulling the cabinets out. The assumption is that moving them downstairs while the floor is being demo-ed may bump or chip them, so we'll put the painting effort in when they are safely out of the way, in the basement, where the doors are currently laid out. Even though we are on vacation, our body-clocks haven't quite got the message. Norm is awake around 5am, while I usually awake around 6. He just lies there for the hour, worrying about things. Like how the city building code red tape will wind up with us losing the house and a cell in debtor's prison. If we're lucky. Not sure what happens if our luck turns bad. He has a large capacity for imagination. He is now composing a rap opera about 2 families who live across the street from each other and want to improve their properties. One stays on the straight and narrow, and hires a contract lawyer, all the properly licensed tradesmen, a financier, and a project manager, so every project meets the building department's policies and procedures. The neighbor across the street has friends and family who renovate his house. The basic lines of a libretto are there, but details need to be filled in. Not to mention the music. Once we got some Cheerios and yogurt into us, and coffee, we were in much better moods. We got out the sandpaper once again, because someone thought maybe there were some high spots in the primer coat. Not saying who. So another round of 320 grit on all the surfaces. Now we could break out the paint. We bought Benjamin Moore Advance Waterborne Interior Alkyd Paint. Our friends at Lamson and Davis, in particular Mark in the paint department, ordered this for us over a week ago. They don't carry this particular formulation in gallons at the store, but Mark noted that folks have been asking for it recently. He also mentioned that folks come in looking for specific products that they have seen in DIY blogs. I found Young House Love Blog quite a while back, and have been following this young couple's home renovation journey. They did their second kitchen last year, and have shared an incredible amount of information and helpful tips. 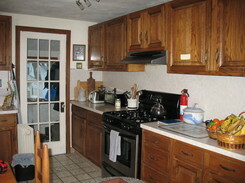 Benjamin Moore's Advance paint was what they used to paint their oak cabinets. Their kitchen looks great, so we are encouraged. The color we chose was MilkyWay (OC-110). It's found in the off-whites section. We had taped up a paint sample on one of our cabinets oh maybe 2 years ago, of a color called ClamChowder, a Behr color. It was a sort of creamy yellow, a bit darker than what we eventually chose. MilkyWay is almost white, but has a nice yellow feel to it, and is more on the creamy side than green or grey. Warm. It's hard to capture in the pictures. 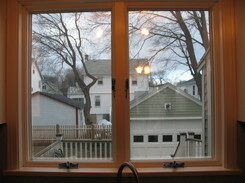 Here is the kitchen window with one coat on. These may be better. These two doors have one coat of paint on them. We were able to do the backs and fronts today, first coat. The paint dried quickly to touch, probably a little over an hour. We did the backs first, and then flipped them to do the fronts. We will now wait the 16 hours for complete drying, and tomorrow we will sand and put on a second coat. We tried a variety of tools. We had purchased the 4" Purdy rollers at Lamson and Davis, and also the mohair refills. We used these for the primer, and found they were a little nappy. Some folks recommended foam rollers, so we bought some of those as well. We tried the foam rollers, but they seemed to leave a lot of bubbles. Norm rolled, and E tipped. E used a 1 1/2" brush to get in the grooves and moldings on the fronts. At one point Norman switched to a 2" brush, on some of the smaller doors. And then Norm tried the microfiber Purdy roller refills, which seemed to do a better job than the foam rollers. It may be moot, maybe just waiting for the paint to settle would have negated all the extra effort to smooth out the paint. E has been known to be a bit obsessive from time to time. Anyway, we are happy with the results of coat #1. Yesterday, we confirmed with Fred's Cabinets and Hardware, the specs for the countertops. This is probably a whole other blog post, and maybe I will do that Thursday, when I head down to the Cape. Meanwhile, you must just take it on faith, that we have been thinking about different materials and their benefits and costs, and we have decided on formica. Son Zach gave us a great book a few years ago, "Sheetrock and Shellac", a thinking person's guide to home improvement, by David Owen. In his philosophical meanderings, he came full circle on countertop materials, back to formica as the most practical and utilitarian. I know everyone wants granite, but I don't. Not interested. The formica we had, was put in somewhere in the late 70s and was still useful, if maybe not stylish. And new formica costs a fraction of the fancier materials. When we sell our house, the lucky family can easily replace the countertops with their stone of choice. We did waver a bit on getting butcher block. I researched a bunch online, and loved the look and knew I would love the feel. I'm not sure I would have loved the care and feeding of wood countertops though. I barely take care of my small cutting boards now. We went to Ikea on Saturday, to look at the oak countertops there, which are very reasonably priced, and readily available. I was surprised though, that I didn't immediately warm up to them. In Stoughton, they use the oak material to display all the other accessories, like sinks and faucets and appliances. So there are many square feet of oak butcher block, which makes it easy to visualize what it would look like in your kitchen. But no, I was not thrilled. The utility of formica won out. We measured and I faxed over the specs to Fred's, with the color that we had picked out. It's called Colorado Slate. A greenish, brownish, coppery rendering of, hey, Colorado Slate. Paul at Fred's told us that the darker the color, the easier it would be to hide the diagonal seam where the counter turns 90 degrees. He took us back into the shop to show us the various edges and construction. Since Paul knows his business, we took his advice and went with a color that is perhaps darker than I would have picked. Also more colorful. I am not a brave person when it comes to color. Norman is thrilled with the introduction a color into the room, so I am going to love it. Really. I've lived with this kitchen for nine years, so I'm sure I can manage some green with my pale yellow cabinets. Say yes. 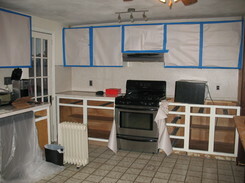 Remember what the kitchen looked like on Saturday..
You can see the ClamChowder paint sample taped to the cabinet above. After we finished painting and had some lunch and made some trips to Lamson and Davis and The Sail Loft, to pick up my misplaced watch, we had some time. So Norman decided to move two of the base cabinets, since that was another thing he was thinking about at 5am, in addition the rap opera. He got the countertop off the section to the right of the stove, and then proceeded to detach the two cabinets there from the wall, where they were just nailed in. Pulling them out revealed some good news. The tile floor does not go all the way under the cabinets! Yay! 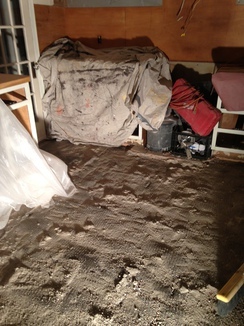 The bad news is that under some pink insulation, there is probably no subfloor. Sometimes there are just surprises, but not the ones you imagined. With that good news, we decided to go to Wolfers in Waltham and look at lighting. This will definitely be another episode. We didn't buy anything today, but we have some ideas as to what we need to do. We got a great education on under-counter lights, and pot lights, and brought some specs home to study. Tonight we finished the White Bean and Kale soup, and cooked up a nice Lentil soup with yams, to put in the refrig. At some point we won't have our stove, so we're cooking from the pantry. Monday morning, and no alarm clock for work. The whole week stretches out ahead of us. Spring vacation from Emerson for Norm, and leftover vacation from 2012 that I have to take before the end of March. Norm feels the need for a substantial breakfast, so we use up the mushrooms and peppers in the refrig and have a scramble in pita. mmmm... Read the Wall Street Journal with our eggs and coffee in our pretty disassembled kitchen. Then clean up our boat dishes, and get out the deglosser and rags. And off we go. For a couple of 62-year olds, we're moving right along! 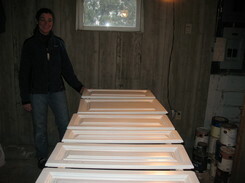 We got all the doors, front and back, drawers and cabinet frames deglossed in about 2 hours. We used Klean-Strip Easy Liquid Sander Deglosser. Wipe on, and rub slightly. It only needs 10 minutes to dry. 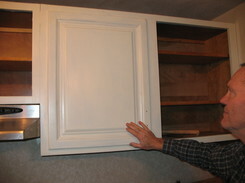 The cabinet surfaces were in amazing shape, considering that they have been doing duty since the late 70s. The original finish was varnish bright finish. It seems that they had never been polished or waxed. I guess the former owners took very good care of them. The varnish wasn't softened or gummed up. There was very little dirt or grease on them. We totally lucked out. We washed them with TSP yesterday, and lightly sanded them with 320 grit, just to smooth out the grain from the washing. Then we wiped them all down with denatured alcohol to remove the dust. We wanted to make sure they were clean and ready to accept the paint. Next step then was the primer. We used Benjamin Moore's High Hiding Multi-Purpose Primer. We used a variety of implements. Small Purdy mohair roller, foam brushes, bristle brushes. Rolled on the flat parts, like the door panels, drawer fronts and cabinet face frames. Brushed the grooves in the moldings and the small corners and inside edges of the frames and drawers. 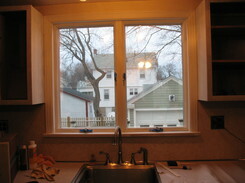 We also primed the window over the sink, which had made an enormous difference in the feeling in the kitchen! 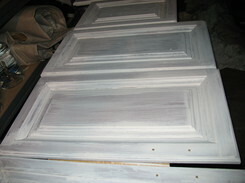 And I also primed the frame of the antique inside (outside) door to the back door mud room. The trim around these two features was put in when the kitchen was remodeled in the late 70s and it doesn't match the rest of the trim in the house. So we don't see a reason to try to preserve it "woodiness". 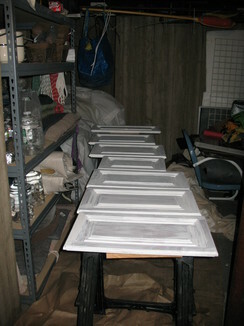 It is neither cherry (original house trim) nor oak (cabinet wood), so both these frames will get a coat of paint too. With only the door fronts left to prime after lunch, we took a ride to the City Hall, to visit the Building Department. Our friendly electrical inspector came to the counter to hear our questions. 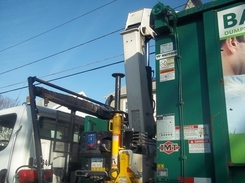 Our topic for today was about using a new product offered by Waste Managment called The Bagster. Our driveway is too narrow for the dumpster providers to be able to drop off a dumpster. And we don't really have much space at the street, and that would also require a permit from the City. 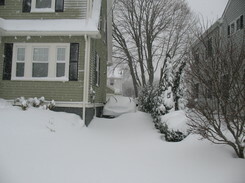 Here's a picture of our driveway, taken during recent Winter Storm Nemo. Hard to tell due to the enormous amount of snow, but the width is only about 8.5 ft at its narrowest. No go to a dumpster. So we wanted to find out their thoughts on this new idea, and make sure we would be within the outlines of what a good homeowner is allowed to do. Apparently The Bagster is fine, although we need to check back with the building inspector tomorrow. So, know any licensed electricians or plumbers that work on a consulting basis? And would be willing to pull a permit? Ok, back to today. So after the visit to the building inspector's office, we ran along to our new favorite home improvement store, Lamson and Davis, in Malden. We've had great service in the paint department from Mark, and today we met Ann. We needed more foam brushes and tiny roller refills, and The Bagster, which they sell. Plus, we wanted to look at tools. What's a home improvement project without new tools. Isn't that the whole point? Seriously. So we told Ann about our really ugly tile, set in a bed of mortar that must be 3ft deep. And did Ann mock us? or roll her eyes? No, she took us to see awesome tools of great power and force. Now we are the proud owners of a walloping tong. Well that is what Norman calls it. 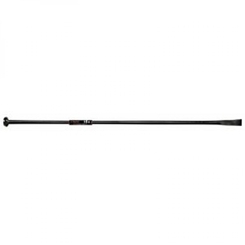 It looks like this tool at Backyard Gardener, but we got it at Lamson and Davis. It's about 70 inches long and weighs 16 pounds. And has a nice blade at the bottom. And we also bought a small sledge hammer. In case the tong needs some convincing. What could be more fun? Do you have a better way to spend your vacation? I don't think so. So here are the progress pictures, which don't look too much different from yesterday, except that the doors are all turned over to the front sides. We 're going to go over them again in the morning with another coat of primer, to make sure we haven't missed anything. That's Norm and he is still smiling. Isn't he great? Cabinet face frames primed. Window not started yet. Notice the binoculars on the window sill. We are watching the backyard animal life. Three squirrels are doing battle with Norman over the suet feeder and the thistle feeder. We saw Dark-eyed Juncos, Downy Woodpecker, Northern Cardinals, European Starlings at the feeders. And the squirrels. Ok back to the kitchen. The painting system in the basement is great. Every door is laid out. You paint and move to the next one. No shifting to dry. Great job Norm! Tuscan white-bean soup with Kale (simmered with parmesan cheese rinds) for dinner, with French bread and a Sauvignon Blanc box wine. Up bright and early today, ready to roll up our sleeves and get some work done. First task to prep the cabinets for painting, is to wash them down with TSP. We fixed up a pail of hot water (2 gals) and 1/2 cup of Trisodium Phosphate. Put on your rubber gloves! 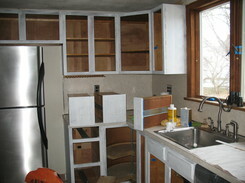 TSP is not highly irritating, but we had lots of square feet of cabinet surfaces to wash down. So soaking in this stuff for hours at a time, can be hard on your hands. The plan was to wash down each surface that will be painted, with a clean rag, dipped in the TSP solution. Wipe, rub. If the cabinet is really dirty or greasy, use a green scrubby. But not too hard! Then we rinsed with a wet microfiber towel. Repeat until no more cabinets, drawers or face frames left. I used this opportunity to also thoroughly clean out the cabinet and drawer interiors. I worked upstairs while Norman worked down in the basement. He has saw-horses and 2x4s in every spare spot down there, so all the doors are laid out nicely at a good height. 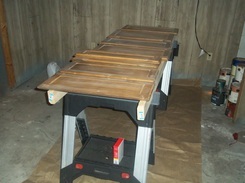 This will make painting and turning them very efficient, since nothing has to be moved to dry. Next step was to give all the surfaces a light sanding with 320 grit. Norm had bought some sanding sponges, which helped him get around the moldings on the doors. 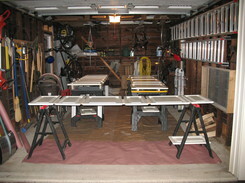 I used flat sheets folded in thirds, on the face frames and drawer fronts. We also used Timbermate wood filler on all the hardware holes. Since we will be replacing the hinges with self-closing polished nickel hinges (Amerock BP565G10, partial wrap self closing), we won't need the magnetic catches on the doors and the metal plates on the frames. The new hinges do not align with the old holes, so we puttied them up too. We did not fill the holes for the handles, since we will re-use them for the new handles. I haven't decided those yet, but they are not on the critical path. 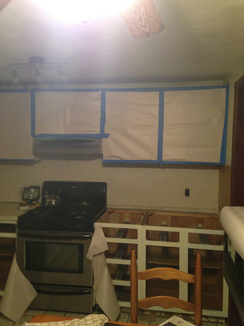 Here is what the dining room looks like after only one day of not having our kitchen. All the comforts of home! 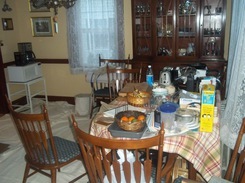 We covered the floor with a drop cloth, and put the supplies we think we will need for a week on the dining room table. I don't know what happens after a week though. At that point, I assume we won't have our stove, or refrigerator anymore. I hope our neighborhood restaurants will be glad to feed us. We stopped around 3pm, so we wouldn't overdo. We're ready for priming tomorrow, and pumped at the progress we've made. Norman is cooking Shrimp Pad Thai while I make this blog entry. I've got to go assist now, or he won't share. Today was my first full day of Spring Vacation. Vacation project is the kitchen re-do. We are still rather unstructured, in that I don't know how much this will cost, or how we will pay for it, what the timeframe will be, and on and on. You would never believe that I project-manage all day at work. Shocking! Norm and I have both done a lot of driving around and cruising around online, looking for products that will make our kitchen beautiful and fulfill our lives! A new kitchen can be your salvation! Ok. First up.Things we can do ourselves. Paint the cabinets. We have kitchen cabinets that date back to 1975. Paul at Fred's Cabinets told us that today. 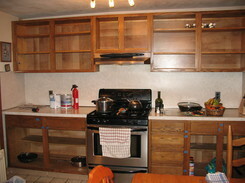 The cabinets are actually in really good condition; they were made really well. Haas was the cabinetmaker. Apparently they do a really good job. 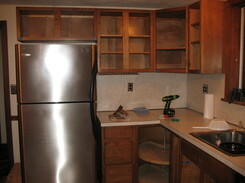 Since the cabinets are in such good shape, we are going to paint them. Paul showed us some nice hinges, polished nickel, that will match our stainless steel reefer and stove. These are self-closing and we won't need the magnetic catches anymore. Yay! Fred's also has most of the hardware for cabinets that you can find online, about the same price. The benefit is that I can touch and feel them. And we brought in one of the doors, so we could see what they might look on the door itself. Of course they are not painted yet, but there is also scale, and style to consider. We're still not decided on hardware yet, but that decision is not on the critical path (oops project management). So we can mull it over for a while more. That's a shiny refrigerator! See the cabinets? Empty. Doors off. All the hardware is removed. The doors are all down in the basement ready for the next step. We're still cooking in the kitchen, but we have bags of food set aside and a menu laid out for the next week. Just like when we go cruising! We are even using our boat dishes! Tonight? Poached salmon, with lemon and ginger; plantains fried in coconut oil; and petite peas with butter. Future meals include Shrimp Pad Thai, Kale and White bean soup (cooling on the stove above); lentil and yam soup, and other things from our pantry. 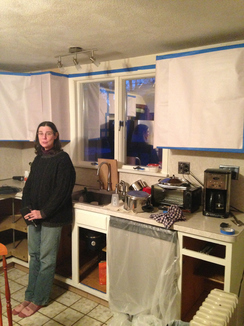 The dining room is now our staging area, and when the demo begins in the kitchen we will be reduced to the microwave and french press. I hear that dinner is ready! Thanks Norm!